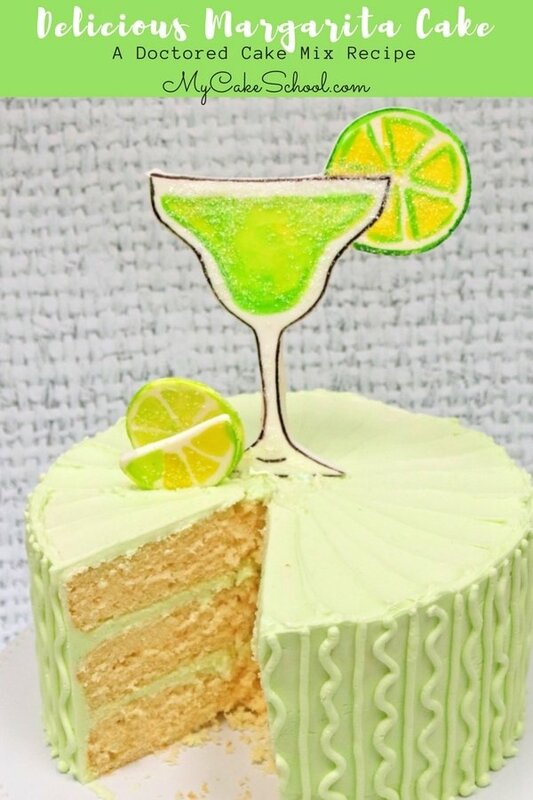 With Cinco de Mayo just around the corner, we thought it would be a great time to introduce a refreshing, flavorful Margarita Cake recipe from a cake mix! I love cocktail-inspired cakes, especially in spring and summer months when the temperatures begin to rise and we crave fruity drinks (and sweets) with a kick! 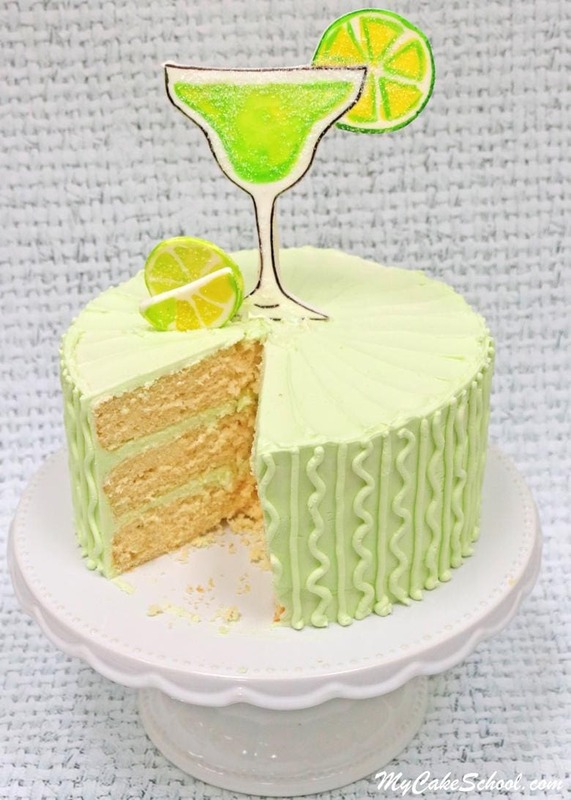 We added an amazing scratch Margarita Cake with Tequila Lime Buttercream recipe to our Recipes Section last year (linked at the bottom of tis post), but wanted a cake mix version of this deliciousness for those of you who either prefer to work with cake mixes, or who like to have a quick and easy go-to for last minute entertaining! You’re going to want to hold on to this one, it does not disappoint! Similar to our scratch recipe for Margarita Cake, this cake mix version has a light tanginess from the lemon and lime in the recipe, and an unmistakable hint of tequila from the buttercream. Often when we create cake recipes, especially if it is based on a cake mix, everything falls into place perfectly after the first or second try. With this margarita cake recipe, we made at least five different versions, and what we discovered in the end (five pounds later) was that in this case, simple is better. Unlike our scratch margarita cake recipe, we did not incorporate margarita mix into the batter of the cake mix version–we tried, but the texture of the cake never came out right. It was too coarse, and no amount of playing around with ingredient amounts helped. But not to worry! It turns out we didn’t need margarita cake mix to make a fantastic margarita cake. We just needed a healthy dose of lemon and lime flavor…and a little tequila. This recipe is SO good! 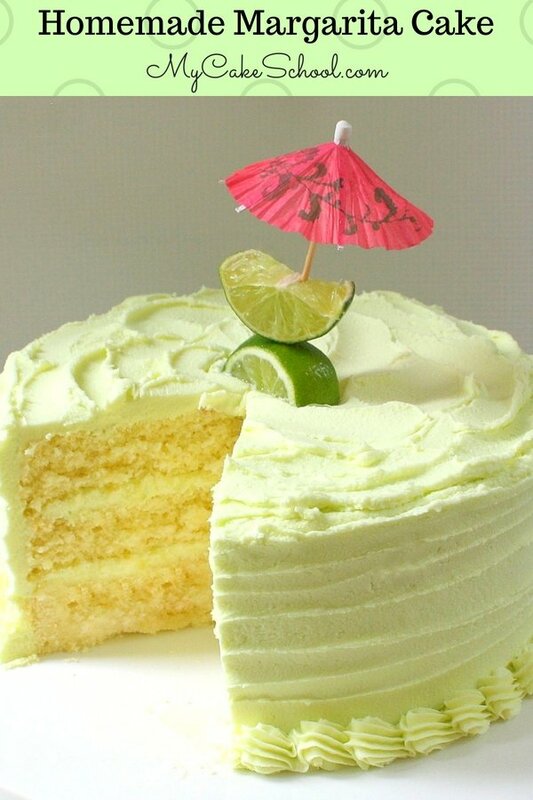 Our margarita cake is loosely based on our White Almond Sour Cream Cake recipe. 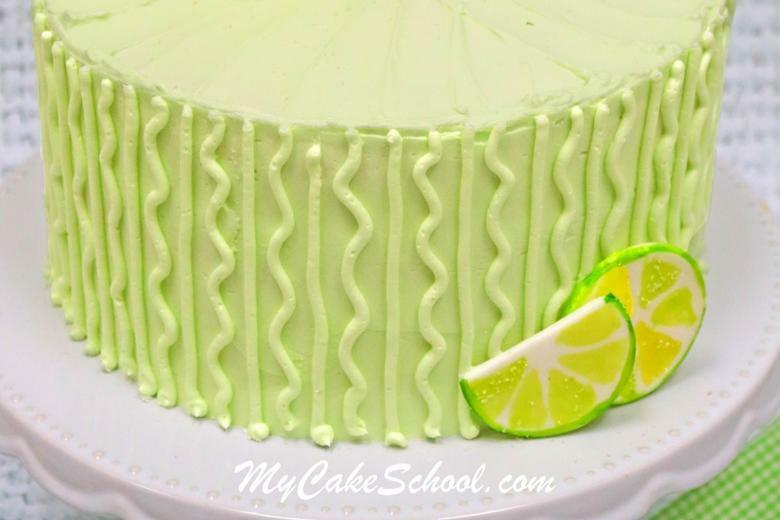 The addition of lime juice, lemon extract, as well as lemon and lime zest gives a wonderful flavor to the cake, and the sour cream in the recipe lends a lovely texture while keeping it sturdy enough for fondant. After frosting our cake with a coat of Tequila Lime Buttercream (which is tinted with a touch of Wilton Leaf Green), I used a small round tip 3 to add vertical lines and squiggles all the way around. 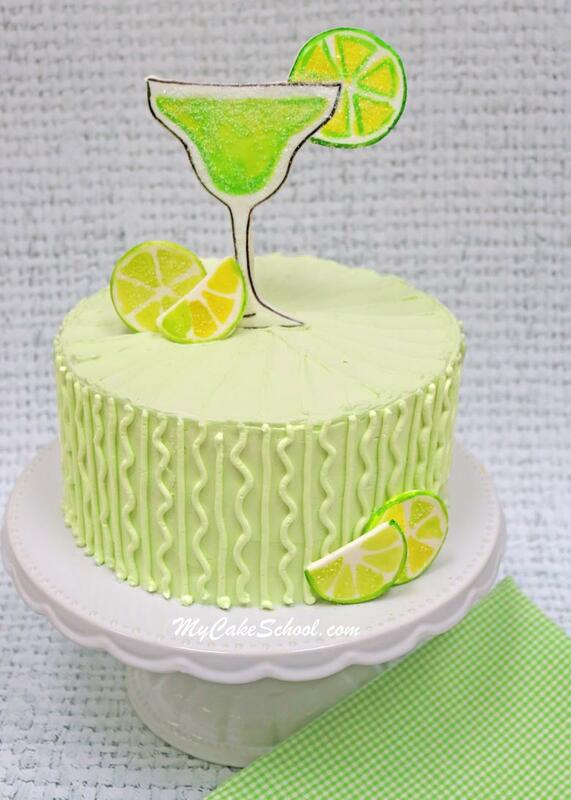 This is such a cute & easy little design but anything goes- the Tequila Lime Buttercream is super easy to pipe with. 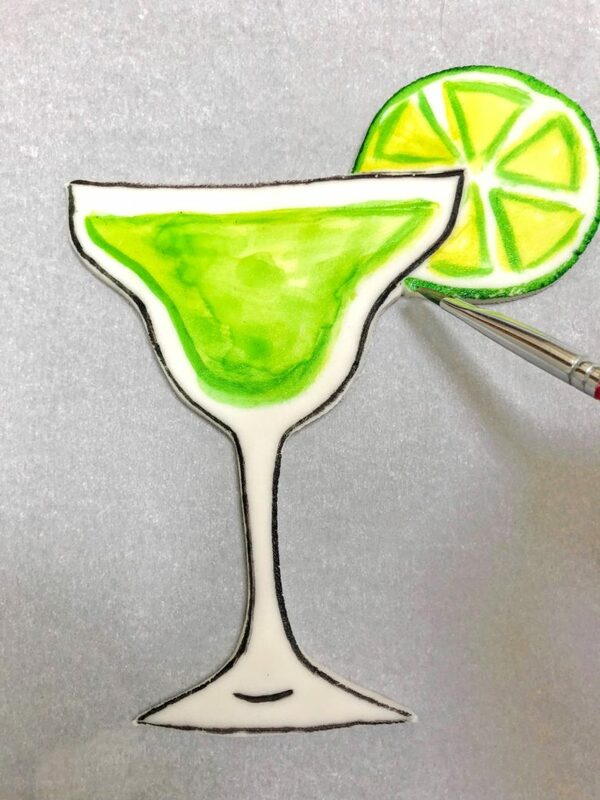 I decided to add a little height and color with a gum paste margarita glass cake topper! This was so easy to make, and I love to incorporate a cake topper whenever possible! 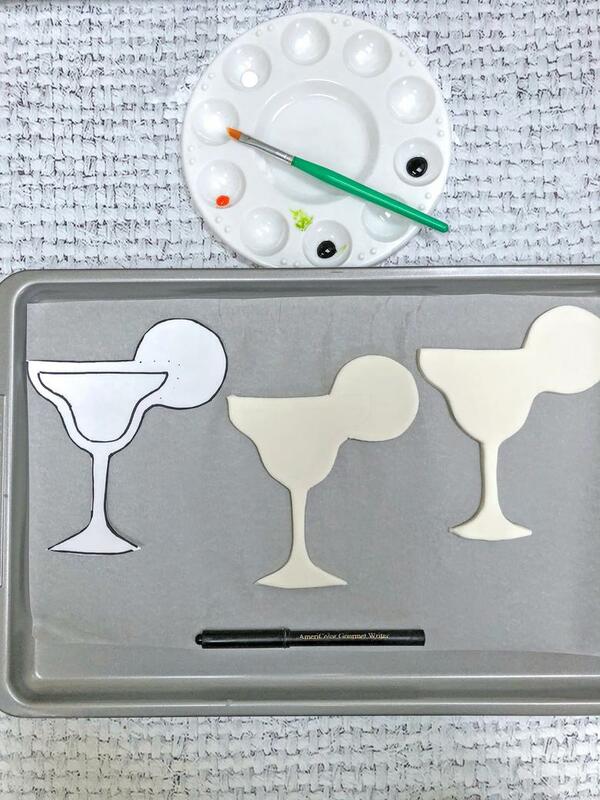 To make it, I rolled out some white gum paste (you can also knead tylose powder into fondant if you don’t have gum paste) and used our Margarita Glass Cake Topper Template to cut out my shape. I filled an artist’s palette with a little Americolor Electric Green, Leaf Green, Lemon Yellow, and White (just in case I need to lighten things up). I also added a splash of vodka. 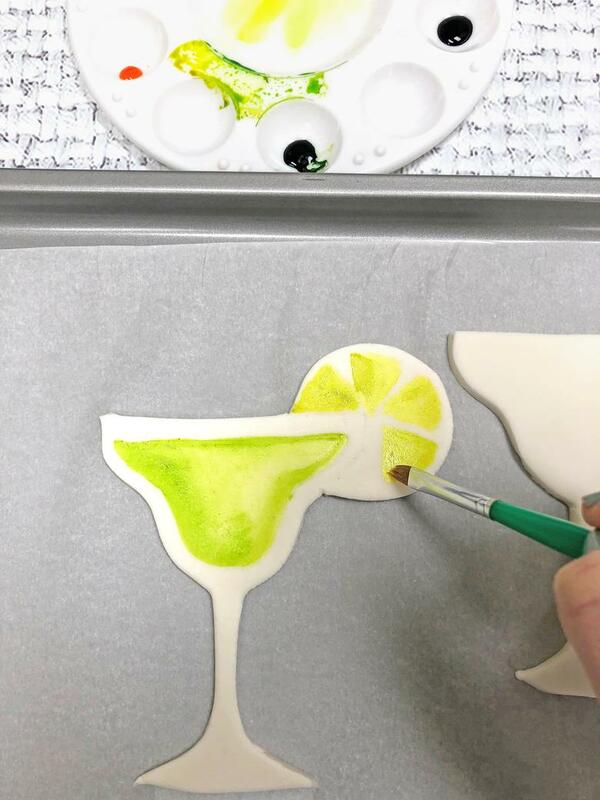 Painting on fondant or gum paste with this method is just like watercolor painting….only with vodka. It’s vodkacolor painting ;0) – Just dip your paintbrush into your coloring gel, mix it with a touch of vodka, and paint away. Of course, the more vodka that you add, the lighter & more diluted the color becomes. You can see below that when it comes to gum paste cut-outs, I always like to make two just in case one breaks! We also added some accents with a black food coloring pen. 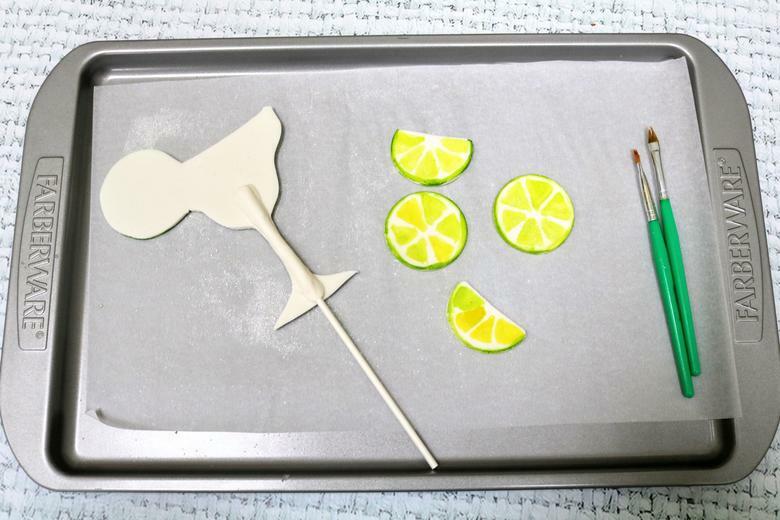 For best results, wait until the surface of the gum paste is dry to the touch so that you can outline it more easily. The color will show up darker & your lines will be cleaner. While still damp from the paint, we sprinkled a little clear sanding sugar over the glass. Once dry, I flipped over the cake topper, placed a lollipop stick anchor in back, and attached it with a lightly dampened strip of gum paste. Allow the anchor to dry for about 20-30 minutes and then check to see if it’s safe to stand upright. (Adjust dry time as needed). I love the height and colors that this cute cake topper gives to the cake! A touch of green coloring gel- Optional. We used a small amount of Wilton Leaf Green. Preheat the oven to 350 degrees. Grease and flour three 8x2" round pans. In the bowl of your mixer, combine dry ingredients and whisk at least 30 seconds to blend. In another bowl, combine sour cream, water, lime juice, eggs, & flavorings. Add the wet ingredients to the dry ingredients and mix on medium speed for two minutes. Stop and scrape the sides and bottom of the bowl midway through the mixing. Pour batter into prepared pans and bake at 350 degrees. Check after 35 minutes to see if the middle of the cake springs back when touched, or a toothpick inserted into the middle of the cake should come out clean or with just a few crumbs attached. The sides with slightly pull away from the pan. Add the lime juice, tequila and milk. Mix on medium speed for 3 to 6 minutes or until it is a light smooth consistency. 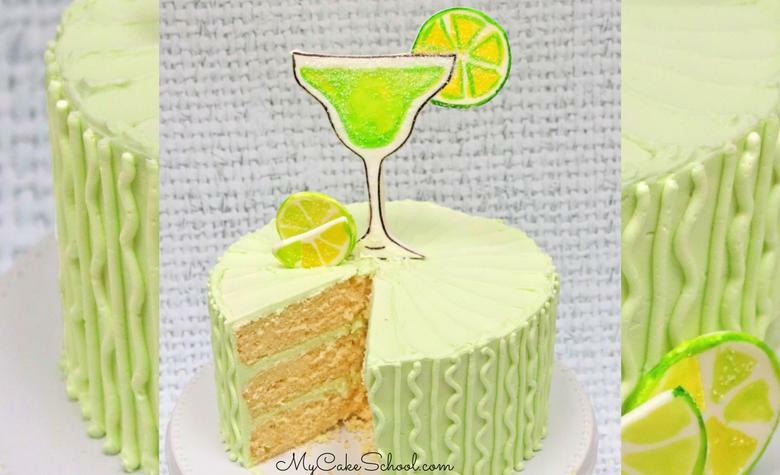 We hope that you enjoy this Margarita Cake recipe as much as we have! The recipe would make for wonderful cupcakes too! For our full collection of tried and true cake and frosting recipes, don’t forget to check out our Recipes Section! If you are interested in learning more about cake decorating, we have free tutorials listed by category in the drop down menu of our Free Tutorials Section! Looks delish! :-) Love the fantastic decorations! Is there no oil or butter in this recipe? Hi Kim, That is correct no oil or butter. I have made one similar to this and used cake flour instead of reg. flour. so much more tender and the taste was great.. try it with cake flour..
Looks delicious! Your pic has 3 layers, what size pans did you use and was this recipe enough for 3 pans? If so how long did you bake it? Hi Marsha! You are right, I’m going to change it to match our photo. Two pans would work too if you’d prefer that. We decided to divide it over three pans this time so that we could have two layers of filling. Hi, I am sorry that happened. We did not notice any taste change when we made the Margarita Cake. We use AmeriColor gel color most often because usually you can achieve the color you want with just a small amount. For this cake we used Wilton Leaf Green. We added a small amount, using a toothpick to add the color. What brand did you use? Can this receipe be made into cupcakes. Hi Cindy, Yes, the recipe can be made into cupcakes. Bake at 350 degrees for 18 to 20 minutes or until a toothpick comes out clean or with just a few crumbs attached.